Having made a tremendous impact around the world with his album Akroasis (2003) in which he performed Byzantine hymns, the versatile Greek Pianist ,Composer and Conductor Vassilis Tsabropoulos became famous with the first place he received in UNICEF's contest (1977) when he was just ten. Born in Athens the pianist, who has been called a child prodigy since the first years of his career, continued his education, which started in Greece, in Paris Conservatory, Salzburg Academy and Juilliard Music School. 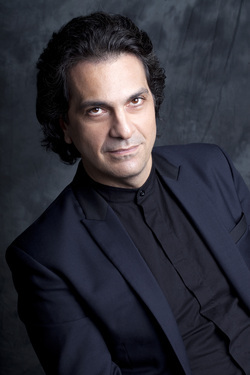 With his extensive repertoire of recitals and concertos, Tsabropoulos has taken the stage with Europe's several important orchestras including among others the Philharmonia Orchestra ,the Stockholme Philharmonic, the Czech Philharmonic, Budapest Chamber Orchestra, Sofia Philharmonic and Italy Radio Orchestra. His repertoire varies from Bach to Beethoven, Chopin to Prokoviev.As a pianist he is highly effective in Russian music, particularly in Rachmaninoff.He has participated in festivals throughout Europe and has performed every season in the musical centers, presenting a wide repertoire in concerts, recitals and chamber music performance. He has made his first USA tour in October 2004 with a significant critical and popular success. Pick of his career is his performances with London Philharmonia and Czech Philharmonic Orchestra under the baton of Vladimir Ashkenazy in piano concertos of Beethoven and Rachmanninoff. Conducting has formed a large part of his activities for the past five years.He took up the conductor's baton in 2006 and steadily increased his activity in that sphere. In addition to his compositions and stage performances as a pianist and conductor being always in close contact with many musicians around the world, he has made 12 solo albums. Releasing his albums under ECM, the versatile musician has made a great success with his first album Akroasis. This work, mentioned by The Independent writer Andrew Clarke as "The effects are hypnotic and mysterious, shimmering like ancient mosaics", has become a world bestseller in its own genre.